Douglas Lake Ranch provides dedicated anglers with some of the best stillwater fly fishing in North America. Our lakes are rich with hard fighting Kamloops rainbow trout weighing up to 10 pounds. The following list of exclusive access lakes are booked and reserved through Salmon Lake Resort. Accessed through the cowboy camp at Chapperon Lake, a small locked gate delivers guest access into this long time angler's favorite. Pike's Lake has been known to boast extremely large rainbow trout to patient anglers. Fish of the double digits can cruise these waters, with an average of 1.5 - 3 pounds being more of the normal. Pike's Lake is managed as a trophy fishery, therefore it retains a moody characteristic as quality outweighs quantity here. A calculated amount of triploid rainbow trout are stocked annually. Access to Pike's is fairly easy, being located about 20 minutes from either the Home Ranch or Salmon Lake Resort. Located further up the Chapperon Lake road, lies the one of the most picturesque stillwaters of the Douglas Lake Ranch. As a super small, highly productive lake, Harry's Dam is an ideal lake for families, beginner fly fishermen or just about anybody that's interested in spending a day catching and releasing numerous fish in the 1 – 2 pound range. This lake is managed as a quantity fishery, yet every season fairly large trout have been caught and released here. 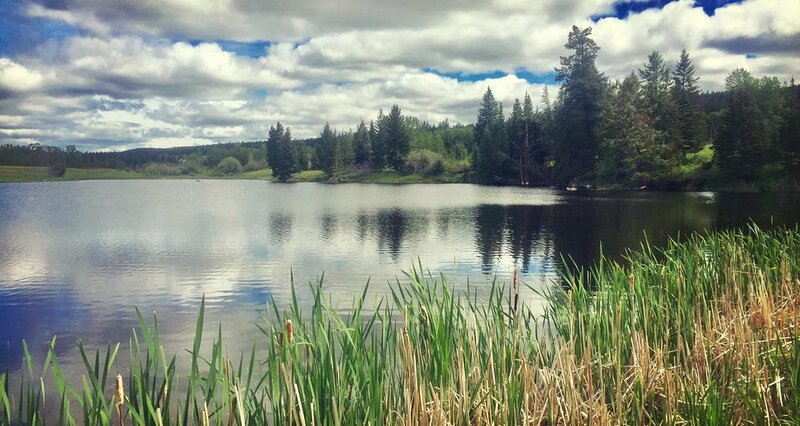 Harry's Dam is stocked twice a year with triploid rainbow trout and is located about 40 minutes from either the Home Ranch or Salmon Lake Resort. Please contact Douglas Lake Ranch for rates and information regarding our exclusive day use fisheries.